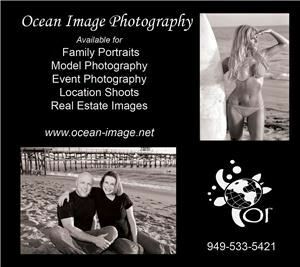 Based in San Clemente We Specialize in Family Portraits, Special Event and Model Photography. Kevin's Photos have been featured on the cover of The San Clemente Journal, the front page of The Sun Post News for the Orange County Register and in articles for the Dana Point News, The San Clemente Journal, Banners on El Camino Real in San Clemente, The American Quarter Horse Racing Journal and the San Clemente Coffee Table Book "San Clemente, the Spanish Village by the Sea.". Kevin is also represented by several Stock Photo Agencies including affiliates of Getty, Corbis and Jupiter Images.